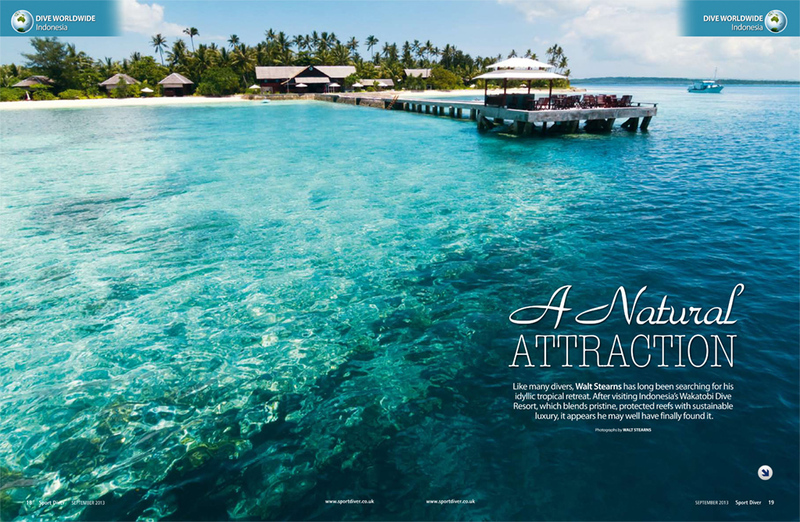 Photographer Walt Stearns puts Wakatobi at the top of his list of dream destinations. Divers have no problem imagining the perfect tropical retreat: A place where warm, clear water covers pristine reefs teeming with abundant and diverse marine life; where seas are calm, with little more than a ripple, and dive sites are just a stone’s throw from luxurious accommodation and delicious meals. And, of course, it’s all within magnificent natural surroundings that both inspire and relax the soul. But the reality of finding such an idyllic resort setting is not always so easy. Traveling to many remote tropical destinations can be a difficult and time-consuming process, and distance no longer guarantees an undisturbed natural environment, as coral reefs around the glove are under assault from both local and international fishing or suffer bleaching. After many years of international travel, I have found only a few destinations that come close to that elusive dream. At the top of this list is Wakatobi Dive Resort. Click on the image to read the full article A Natural Attraction.